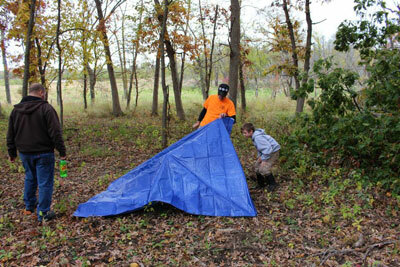 A simple shelter made from a tarp can save your life in severe weather. While zombies don’t pose any real threat to Iowans, the Zombie Apocalypse Survival Camp being held in eastern Iowa in a few days offers important lessons about how to endure severe winter weather, if stranded. Guy Cain, founder of the camp in Linn County, says the blizzard conditions that struck the state last week serve as a clear example of how harsh conditions can become, very quickly, when wind chills hit 40-below zero.